Urinal Gum: I'm a Law-Breaking Cyclist and Proud of It! I have to confess something here: I do not always follow the laws while riding my bicycle. I also always ride in the road, and I have no problem yelling at motorists who yell at me. To me, a stop sign or light means yield and turn signals are optional for cyclists. And, I honestly don't care if this pisses off you lazy motorists. First, let me address the least controversial aspects of my above statement. The reason most motorists will yell at me is because I am in the road and may be slowing their roll to their fatty feast restaurant for the night. Oregon law is similar to most states in that cyclists are expected, and in many cases required locally (i.e. in downtown Eugene), to ride on the right side of the right lane of the road. Cyclists may venture into other lanes for the purpose of turning. This is done because it is dangerous for cyclists to ride on the sideWALK because motorists simply do not look for cyclists on the sidewalks and are likely to hit them. Consequently, when motorists yell "Get on the sidewalk!" at me, I'm likely to yell my stock response "Get a bike!" right back at them. More angering to most writers of letters to editors is cyclists who don't obey the rules of the road. The main issue is cyclists running red lights and stop signs. And, though there are many reckless cyclists out there, for the most part, this anger is unfounded. My main justification for breaking the law is that the roads simply are not designed for cyclists. Per a 2011 Eugene Weekly article, bicycles have a mode share of 11% in Eugene, the highest in the nation for a city of its size. 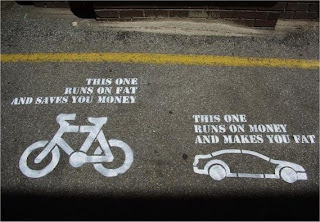 But, spending on bicycle transportation is only 2% of the total transportation budget. That's pretty low for a city that claims to be so progressive. This lack of spending is evident in such things as traffic signals that don't have sensors that recognize bikes. They are out there. I've waited at these lights for fives of minutes hoping a car would pull up and let the light know humans were waiting on it to turn green. Eventually, I am forced to break the law much to the detriment of society. More evidence is many traffic lights do not stay yellow long enough for most casual cyclists to safely get through before they turn red. There is institutional ignorance of cyclist safety that can be seen whenever there is construction: the first lane closed is the bicycle lane. They never close a motorists' lane and leave a bike lane open. Similarly, if motorists need to stop in the road for any reason, they always park in the bike lane rather than in a motorist lane. This forces cyclists into traffic. You can see this at any given moment on 5th Street in Eugene. Though it falls in the "just because everyone else does it, doesn't mean you should" category, it is also worth mentioning that motorists rarely complete an entire car ride without breaking the law. I've had my life endangered because motorists failed to use their turn signals, were busy illegally using their stupid phones, or they just plain decided to stop inappropriately because they thought they were being "courteous." These motorists never received a citation for their behavior. These things taken into consideration, I take the law into my own hands while cycling. The law does not protect me, so I have to protect myself and play by my own rules. I like to think of myself as an incredibly lame Charles Bronson when I'm on my bike. I've adopted a One-Block Rule: if there are no motorists, pedestrians, or bikes who have the right-of-way within one block of me, I will run a red light. I will not come to a complete stop at stop signs unless I have to, though I will yield to those within yielding distance, in order to get through the intersection more quickly. I will only use my turn signals when it is safe for me to do so. I like to think my judgement is sound in the above unorthodox methods. I bike around 75 miles per week on average and have only had one major accident: I was gawking and ran into a concrete pillar and broke my hand. No cars were involved. Even if I were to get in an accident with a car, who do you think would take the brunt of it? Finally, all of this is irrelevant because cyclists have the moral high ground. In a country full of fat lards, cyclists are choosing the healthier alternative. With fossil fuels choking our skies, cyclists are choosing transportation that is clean and reducing our reliance on fossil fuels. With car crashes killing more Americans than guns, cyclists are choosing safer transportation. With Americans in more debt than ever before, cyclists are riding on the cheap. And, the list goes on. In these ways, the worst, most despicable cyclist has the moral superiority over the Prius carpooler. If you don't like it, I strongly suggest you sell your car and hop on a bike. Image maliciously stolen from endlessvelolove.blogspot.com.